L to R: Seamie Murray, Jim O'Mahony, Paudie Donnelly, Padjoe Lanigan, Bernard Gorman, Tony Mansfield. This week's photo comes from the club social of 2004 and features the selectors who masterminded championship victories in the Minor and U21 grades in 2003. Honours secured by the team included the Western & County Minor 'A' Hurling, Western & County Minor 'A' Football and Western & County U21 'A' Football. CLG Dún na Mainistreach / Baile na Cúirte would like to wish all its members and supporters a very Merry Christmas and a happy and healthy New Year. 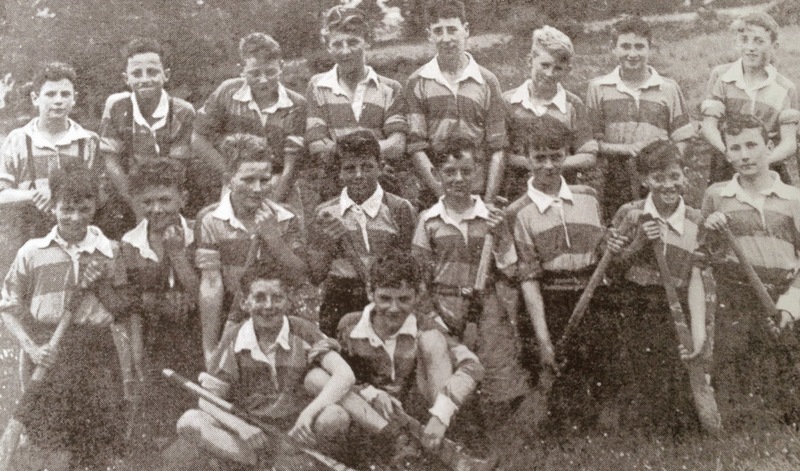 Back Row (L to R): Paddy Whelan, M. McGovern (background), J. Clancy, L. Whelan, A. Flynn, G. Flynn, M. O'Connor, P. O'Connor, T. Collender. 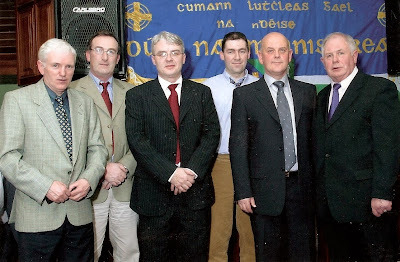 Front Row (L to R): P. Browne, A. Foley, J. O'Connor, Patcheen Whelan, N. McGovern, J. Hogan, D. Whelan. 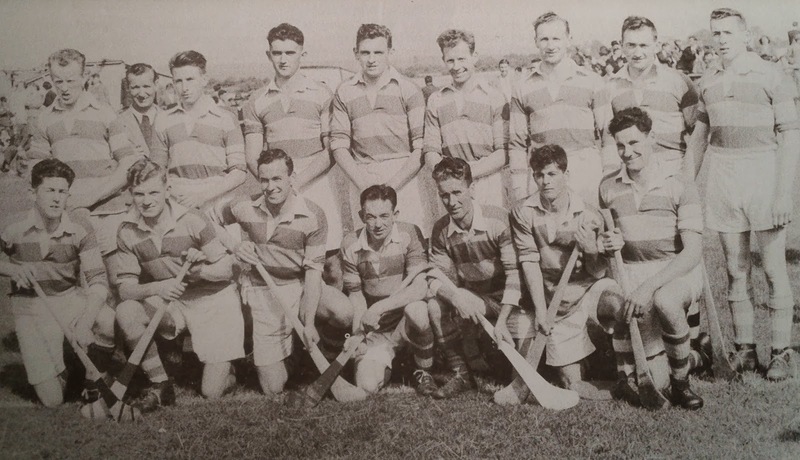 This week's photo comes from 1954 and the County Senior Hurling Championship Semi Final between Abbeyside and Mount Sion at Fraher Field. The Village men qualified for this stage of the competition following tight victories over Dunhill and Cappoquin. However, they were well beaten (7-4 to 3-2) in the penultimate round by the great Monastery team of that era. Our popular Jack the Joker Fundraiser will continue this Sunday night in Kennedy’s Live where the Jackpot will be €7,250 as on Sunday night Barbara Clancy was drawn out of the drum and picked card 51 but did not find the Joker, yet she did win €50. Helen Rossiter and The Morning Club won € 25 each. Every year there is always considerable interest in what song is at number one in the charts for Christmas but this year we would appeal to all our supporters to help make a very special song number one. The song “My Hero” was written by students of Presentation Secondary School, Clonmel is a tribute to their teacher Alice Strain who was tragically killed during the year. Alice was of course a sister of Vera Collins and it would be great to see this wonderful tribute to Alice beat off stiff competition from X Factor etc to claim the number one spot. The song can be downloaded from itunes and all profits from the single go to the St. Vincent de Paul Charity. If possible please download the song by midnight on Thursday night. Tickets are currently on sale from any Club Committee member for our Annual Christmas Raffle which will take place in Minnies Bar on Monday night, December 23rd at 9pm. Tickets are priced at €2 each or three for €5 and we ask all our supporters to please support the draw. Last week our own Gary Hurney announced his retirement from the Inter County Football team and all of us in the club would like to congratulate Gary on his distinguished career with the County. Over the course of his career Gary represented his County in both codes at Minor, Under 21 and Senior, as well as playing Inter Provincial Football for Munster on a number of occasions. Throughout this time Gary remained totally committed to his club and despite suffering a number of very serious injuries the number of games that he missed could nearly be counted on one hand. Once again we congratulate Gary, not on his retirement, but on what he achieved during his playing days with the county and we hope to continue to see him lining out for us for many years to come, whilst he enjoys a little bit more time with Tammy, Lochlain and Jarlath. This Sunday our Club Bingo continues in the CBS Hall where the jackpot is €700. On behalf of all in the club we would like to wish all our members a Happy and Peaceful Christmas. We would also like to welcome home any members who have traveled home for Christmas, and it is great to see Daryl Ryan and Eoin Brackett home from Australia for the Christmas period. Finally we would like to thank the editor and staff of the Dungarvan Leader and Dungarvan Observer for all their help and assistance throughout the year and wish them a Merry Christmas. Nollaig Shona agus Athbhliain faoi Mhaise daoibh go léir. Everyone involved with the club would like to send out a big thank you to anyone who helped in any way to making the trip of the Australian touring side so successful last Monday night week last. From the parents who took in children to Babs Kiely and her staff at the Friary College for providing the food after the game a big thank you to everyone. Without everybody’s help the staging of this very successful compromise rules game would not have been possible. The games themselves were interesting to say the least. Each game consisted of the normal football in the first half and the oval-ball in the second half. In the under 15 game we were up against very strong opponents and despite trying very hard on the night the Aussies were physically too strong for us and we got beaten in this game. However the under 16 squad all put their shoulder to the wheel to make sure we weren’t going to lose both games and matched their opponents in the physical stakes and came away in the end with a hard fought win. Thank you to all the players who played on the night. I think it’s fair to say they all enjoyed the experience and will remember it for a long time to come. Thank you to our field committee for having the grounds looking so great for this time of the year. It was a credit to everyone involved. Thank you to the parents who brought desserts and cakes with them to the Friary after the game to help feed our local players and parents as well as our touring visitors. After the game our chairman Michael Ferncombe made a presentation to all the touring Australian players as well as thanking them for visiting as well as the Man of the Match awards. Overall a very successful night was had by all and we would most like to thank the touring side for giving us the opportunity to host them and to their referee who helped our lads beforehand with the rules. Well done to all. Everyone on the juvenile committee would like to wish all our supporters players and parents well over the Christmas. Happy Christmas and New Year to one and all and hopefully we will see ye all again soon in the New Year. Last Monday, 9th December, players and mentors from Australia visited our club grounds to play our U15 and U16 panels in two Gaelic Football / Australian Rules matches. Click here to see pictures of what was a wonderful evening. Many thanks to Mary Gorman for providing us with the photos. Our popular Jack the Joker Fundraiser will continue this Sunday night in Kennedy’s Live where the Jackpot will be €7,010 as on Sunday night Ger Darcy was drawn out of the drum and picked card 44 but did not find the Joker, yet he did win €50. Laurance Power and Kay O’Connor won €25 each. Tickets are currently on sale from any Club Committee member for our Annual Christmas Raffle which will take place in Minnies Bar on Friday night, December 20th at 9pm. Tickets are priced at €2 each or three for €5 and we ask all our supporters to please support the draw. This Sunday our Club Bingo continues in the CBS Hall where the jackpot is €650. On behalf of all in the club we would like to congratulate all in Ballysaggart on their fantastic victory in the Munster Junior Hurling Final on Sunday last and wish them the very best in their All Ireland Semi Final in the New Year. There will be a meeting of the club committee on Thursday, December 19th at 8pm in the Clubhouse. Our Club Social has been fixed for February 15th in the Park Hotel, and we will have more details on this in the coming weeks. It promises to be a great night where we will be presenting medals to our victorious Senior and Under 21 Football teams and our Junior Hurling Team. 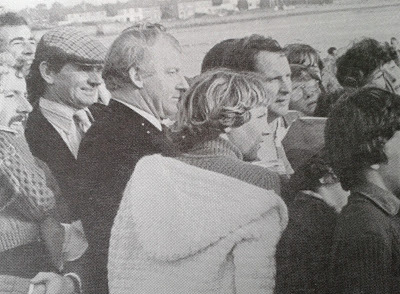 This week's photo brings us back to 1979 and the presentation of the Conway Cup to Joe Power by County Board Chairman, Ciarán Ó Riain following Ballinacourty's narrow one point, 1-12 to 1-11, victory over Ferrybank at Fraher Field. Delighted supporters join in the celebrations. Our popular Jack the Joker Fundraiser will continue this Sunday night in Kennedy’s Live where the Jackpot will be €6,776 as on Sunday night Pat McCarthy was drawn out of the drum and picked card 16 but did not find the Joker, yet he did win €50. Edel Wilson and Maurice Whelan won €25 each. On Friday night last we secured our Intermediate status for 2014 thanks to a very good win over Fourmilewater in our own club grounds. TEAM: L. POWER, J. RYAN, J. MOORE, S. O’CONNOR, R. SHEEHAN, P. LYNCH, L. BERESFORD, J. O’MAHONY, E. BERGIN, R. RYAN, L. HURNEY, N. DEE, T. MURRAY, C. KINDREGAN, S. CLIFFE. SUBS: J. DUGGAN, D. HICKEY, P. COLLINS. On behalf of all in the club we would like to congratulate Gray Hurney on being named as County Footballer of the year on Saturday night last. This is a great honour for Gary, his family and indeed all in our club. 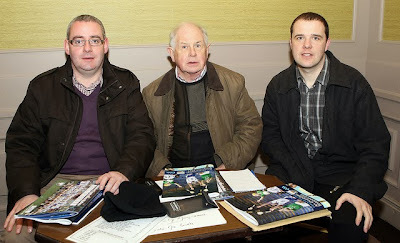 Also on the night the families of the late Tony Mansfield and Seamus O’Brien were presented with awards in recognition for all the work both men did in promoting the GAA through their weekly columns in the local papers. This was a very fitting tribute to the many decades of tireless work both men gave to the GAA here in Waterford. We would like to congratulate Stephen O’Connor and Brian Looby on winning All Ireland Freshers Hurling League medals with UCC last week. It is great to see both lads continuing to play hurling in university whilst Brian is also the only non Cork or Kerry player currently on the UCC Freshers Football team, something that he should be equally proud of. This Sunday our Club Bingo continues in the CBS Hall where the jackpot is €600. The club's AGM will take place on Friday, 6th December at 8:00pm in Ballinroad Hall. On behalf of all in the club we would like to wish Ballysaggart the very best of luck ahead of their Munster Club Hurling Final this Sunday in Mallow. This Sunday at 1:30 pm Paudie Butler will hold a hurling wall coaching session in the club and all are welcome to come along and view what should be an excellent coaching session by one of the best hurling coaches in the country. Our indoor hurling sessions have begun again in the Friary College every Friday night. Our under 5 and 6 team has their session between 6 and 6:45 and our under 7 teams session runs from 6:45 till half past 7. New members are always welcome. Meanwhile out under 8, 9 and ten groups have opted for outdoor hurling at the ball wall every Friday night. Again all are welcome. Times for the ball wall sessions will be given by text to those involved. 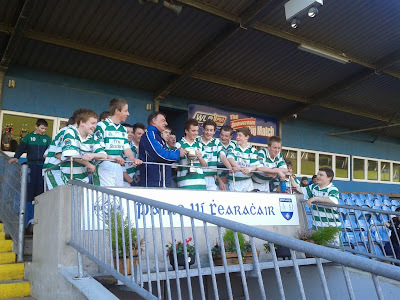 Pride of place this week goes to our under 16 football team who won the county championship on Saturday morning last. Played at the Fraher Field against Gaultir this was really a game that had everything. We played some excellent football on the day and in a match which could have gone either way at the finish a last minute Eoin Kiely goal gave us victory and it was wonderful to see this group of players celebrating their first county championship as a group. After the game we were treated to a meal at the Gold Coast and we would like to thank the Gold Coast for organising the meal in such a short period of time. Everyone in the club would like to congratulate all the players and mentors involved and hopefully this is the first of many county titles for this group of players. It was a fantastic way to finish off the year for the club. Next Monday night should be an interesting night at the Burgery for our under 15 and under 16 football teams. On the night we take on an Australian selection of players who visit our parish as part of a nationwide tour. This should be a fantastic night for all players involved to get to play against sportspeople of a different code. The under 15 games throws in at 6 followed by an under 16 match at 7. Everyone is more than welcome to attend which should be a great night for everyone involved in the club. Anyone who is interested in managing any of our juvenile teams in 2014 is asked to submit their name to Niamh Enright by December 14th. On Friday evening, 6th December there will be an end of year presentation for all players in the Causeway Tennis Club from 6.30 to 8.00pm. We hope everybody can join us. We ask that parents who are dropping off their girls will return for them at 8.00pm sharp. Congratulations to Gary Hurney on being named Adult Footballer of the Year for 2013 at last night's Waterford GAA Awards in Lawlor's Hotel. This is a hat-trick for Gary having previously won the award in 2007 and 2008. Also, the Mansfield and O'Brien families received the Special Merit Award in recognition of the decades of Gaelic Games coverage that Tony and Séamus provided in the local press. A well deserved honour for both families. St. Augustine's College received the Special Achievement Award for winning the All-Ireland 'C' Senior Football Championship, the first national football title won by a Waterford school. 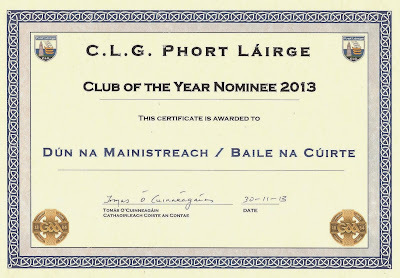 Finally, the club was a nominee for the Club of the Year. The award was won by Passage. Congratulations to our U16 footballers on winning the County Final in Fraher Field today. A tightly contested game ended with a 1-10 to 1-7 win over Gaultier. This title adds to the Western Championship secured earlier in the year. 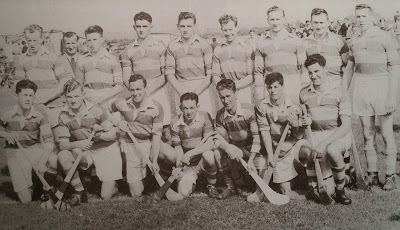 Back Row (L to R): Joseph 'Tucky' Organ, Matthew Hogan, Joe Cleary, John Foley Snr., Billy Hickey, Frank Sweeney, Jonathan O'Donovan, Noel Fleming. Front Row (L to R): Christy Phelan, Michael Briggs, Greg Fives, Séamus O'Brien, Pakie Hurney, Tony Mansfield, Bernard Shields, Tomás Ó Faoláin, Séamus Fitzgerald. Our club AGM takes place on Friday evening next, December 6th at 8:00pm in St. Laurence's Hall, Ballinroad. All are cordially invited to attend. 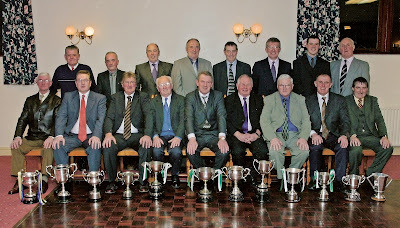 This week's photo brings us back a decade to the committee elected at the 2003 AGM. Many are still actively involved in club affairs while others are sadly no longer with us. Our popular Jack the Joker Fundraiser will continue this Sunday night in Kennedy’s Live where the Jackpot will be €6,512 as on Sunday night Breda Egan was drawn out of the drum and picked card 3 but did not find the Joker, yet she did win €50. Christy Phelan and Conor Clancy won €25 each. 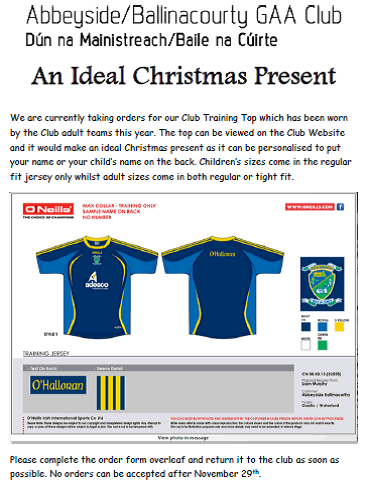 We are currently taking orders for our Club Training Jersey which would make an ideal Christmas present for our supporters both young and old. The jersey can be personalised by printing your name or your child’s name on the back and they are available in a wide variety of sizes. 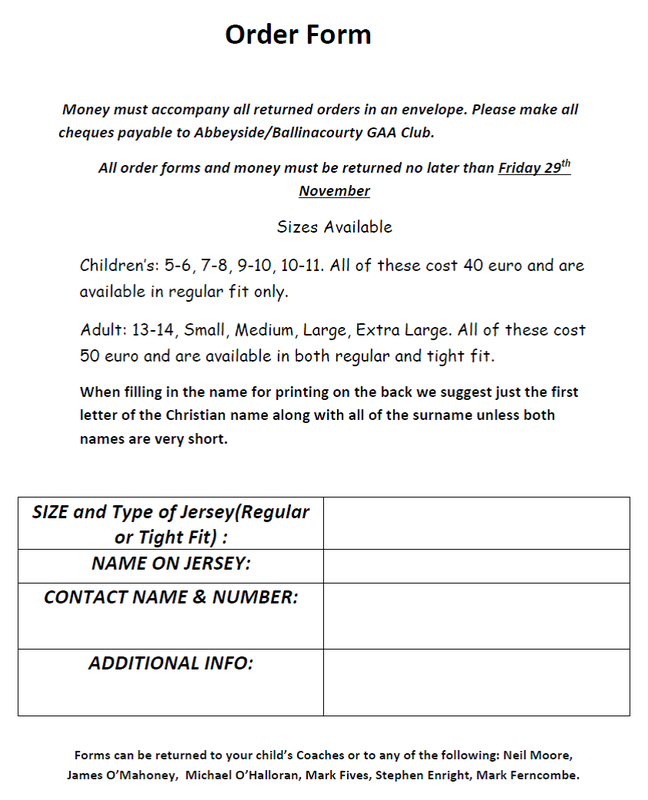 Orders must be made by November 29th and forms are available from juvenile coaches and are also available from James O’Mahony, Mark Fives, Michael O’Halloran, Stephen Enright, Mark Ferncombe and Neil Moore. They can also be downloaded from the club website. Click here to download the form. The final Desie Draw for the year takes place this Friday night and we ask all promotors to please have any outstanding monies with Packie Hurney by Friday night at 6pm. This Sunday our Club Bingo continues in the CBS Hall where the jackpot is €550. Our county final of the under16 football championship was delayed again at the weekend due to a death in the Gaultir club. It is expected this game will go ahead sometime this week but there has been no exact date for this match at the time of writing. Best wishes go to all involved and players will be notified of the arrangements for this game by text. Our indoor hurling sessions have begun again in the Friary College every Friday night. Our under 5 team has their session between 6 and 6:45 and our under 6 teams session runs from 6:45 till half past 7. New members are always welcome. Meanwhile our under 7, 8, 9 and 10 groups have opted for outdoor hurling at the ball wall every Friday night. Again all are welcome. Times for the ball wall sessions will be given by text to those involved. Our Juvenile AGM took place on Friday night last at the clubhouse. There was a large number of people present for what turned out to be a very successful evening. The meeting was expertly run by our chairman Michael Feremcombe and we were given a run down of our finances for the year by our treasurer Kevin Tobin. On the night we also got a very comprehensive run down on club activity for 2013 from our club secretary Niamh Enright. Positions filled on the night were Chairman Michael Ferncombe, Treasurer Kevin Tobin, Secretary Niamh Enright and PRO Sean Kiely. A big thank you goes to all showed up on the night and decided to get involved in 2014 by opting onto our committee. 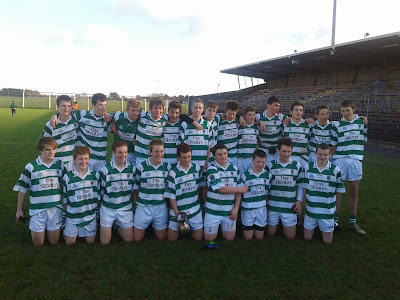 Back Row (L to R): J. Cullinane, P. Beatty, T. Allen, P. Organ (Capt. ), O. Clancy, J. O'Dea, S. Fitzgerald, B. Organ. Front Row (L to R): Tom Leahy, M. O'Regan, J. Browne, D. Flynn, L. Enright, Tony Leahy, A. McGovern, D. Mulcahy. Seated in Front (L to R): J. Elsted, V. O'Mahony. Missing from Photo: J. McGrath, R. Donovan, M. Duggan, M. Phelan. 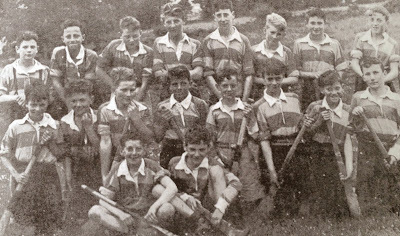 This week's photo shows the first Abbeyside National School team to win the Sheehan Cup, the premier primary schools' hurling competition of its time. This feat was achieved in 1954 when the young Village lads defeated Ballygunner 4-1 to 1-0 in the final in Dungarvan. To order your club training top please fill in the attached form and return it to one of the names mentioned at the end of the form. Click here to download the form.